As we settle in and ready ourselves for the festivities over the coming days, I wanted to pause for a moment and say Thank You. Thank you for visiting here, leaving kind comments, and sharing in these moments of my life. I'm very grateful for the time that you spend time here. Wishing you peace, love and joy. Merry Christmas. 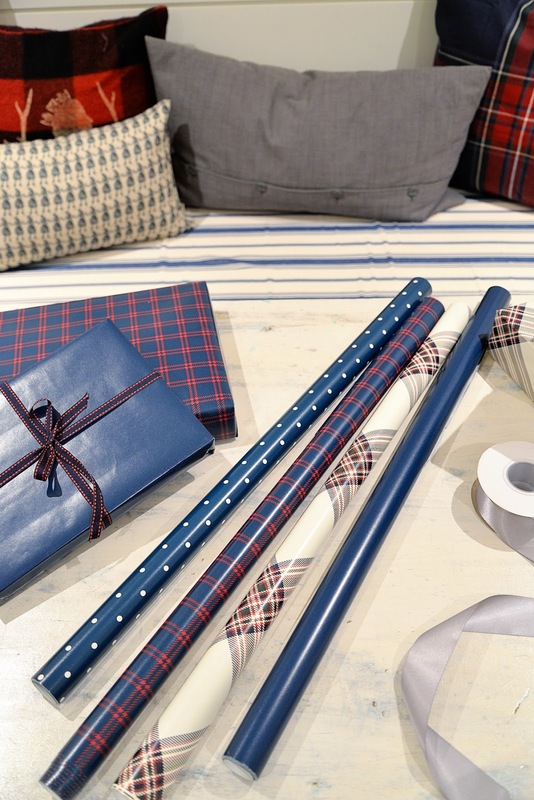 In search of last minute gifts? This book or a gift certificate for Audible.com or Audible.ca would be a great idea. I'll be taking a break for the next week and I hope you are enjoying quiet time too. 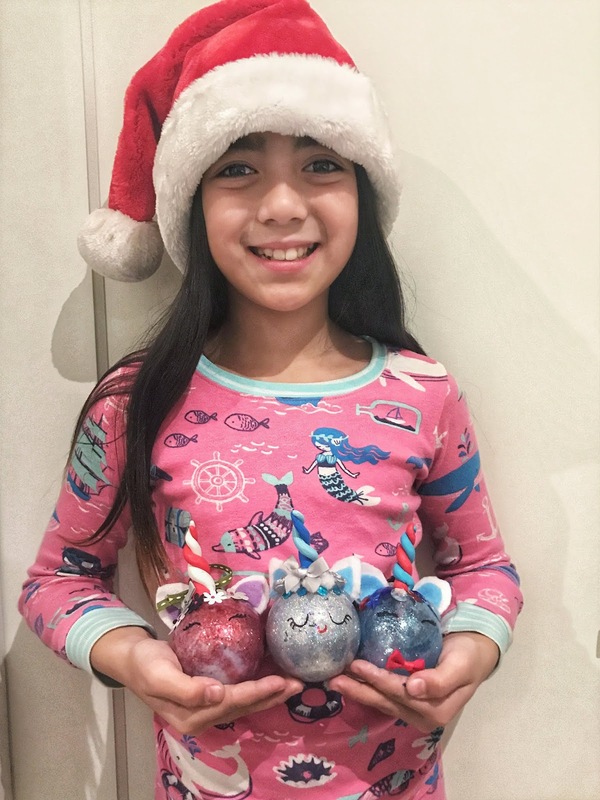 Have a wonderful holiday, friends! 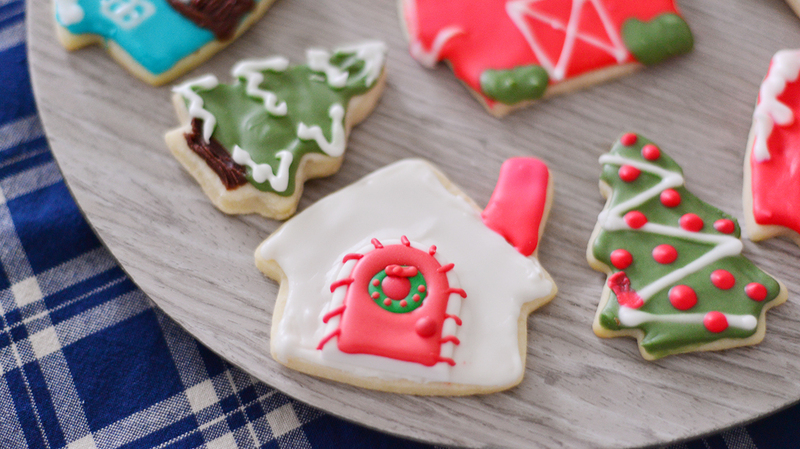 I might be biased, but I'm pretty smitten with these cute sugar cookies. One of our Christmas traditions is to bake cookies and this year's cookies turned out perfectly. That never happens, I usually burn at least one batch, ha! We made this chocolate crackle recipe and a double batch of these sugar cookies. I'll be honest, decorating 60 sugar cookies took a good few hours but it was well worth it. It's a treat to be able to share these sweet edibles with classmates, friends, co-workers, and Jerry the crossing guard. 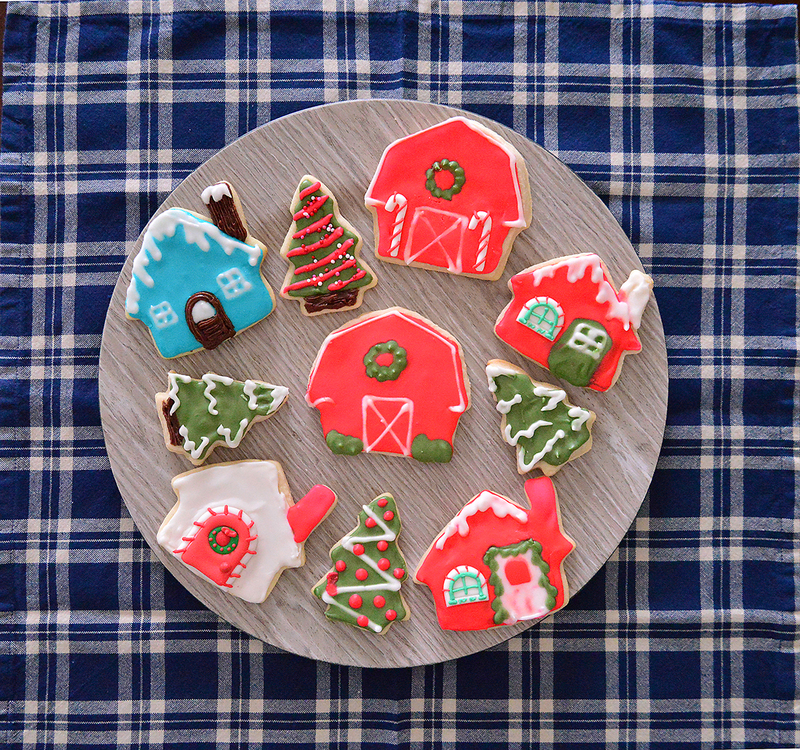 Even when it comes to cookies, I can't quite seem to resist houses. 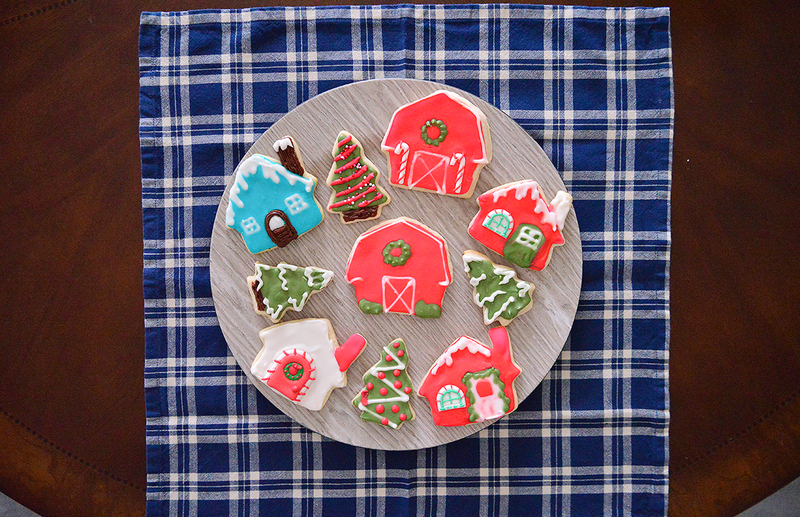 I pulled out the barn, the house, and the tree cookie cutters from my stash. 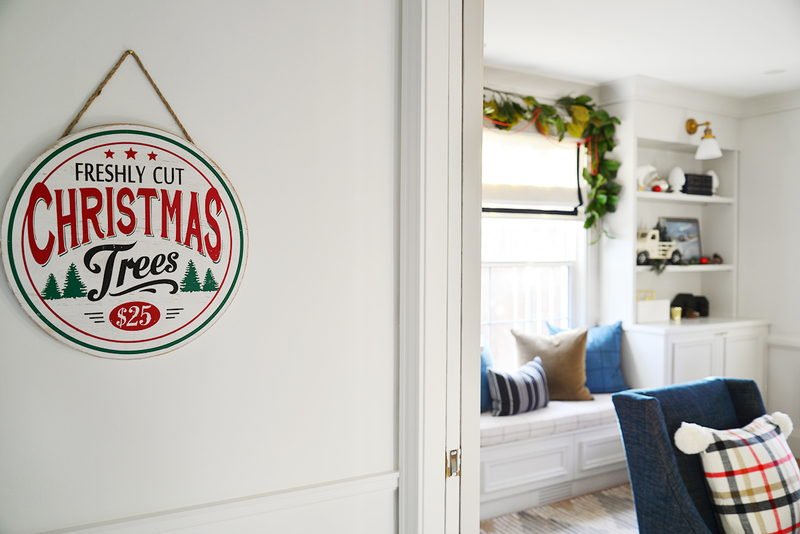 For the decorations, we used some Royal Icing mix from Bulk Barn, food colouring in Juniper Green, Teal and Christmas Red, and some of these cute gingerbread house door and window decor. Line a cookie sheet with parchment paper. Bake cookies for 11 minutes at 350 degrees F.
Let the cookies cool. 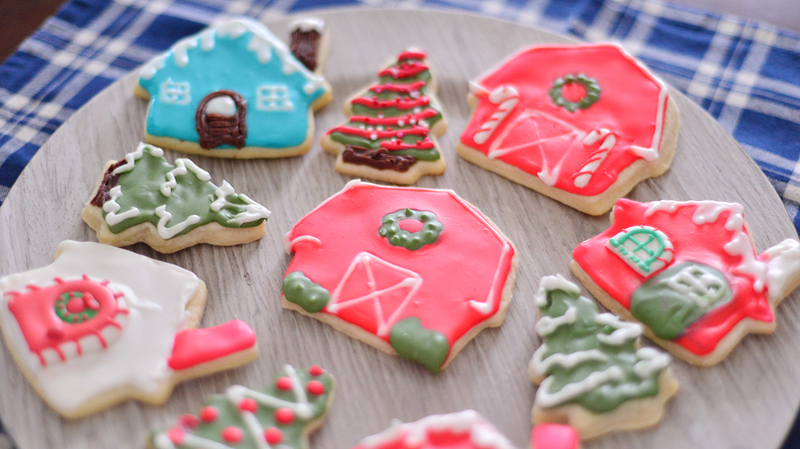 Decorate with royal icing. 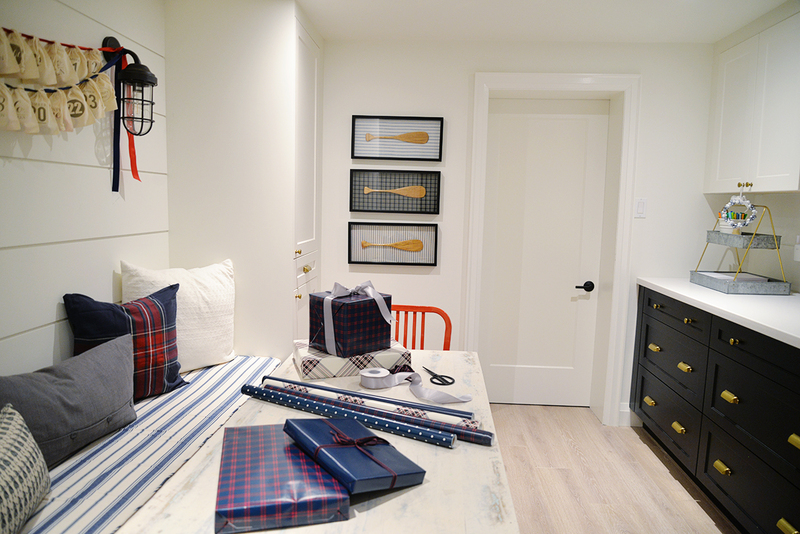 The decorating is my favourite part. 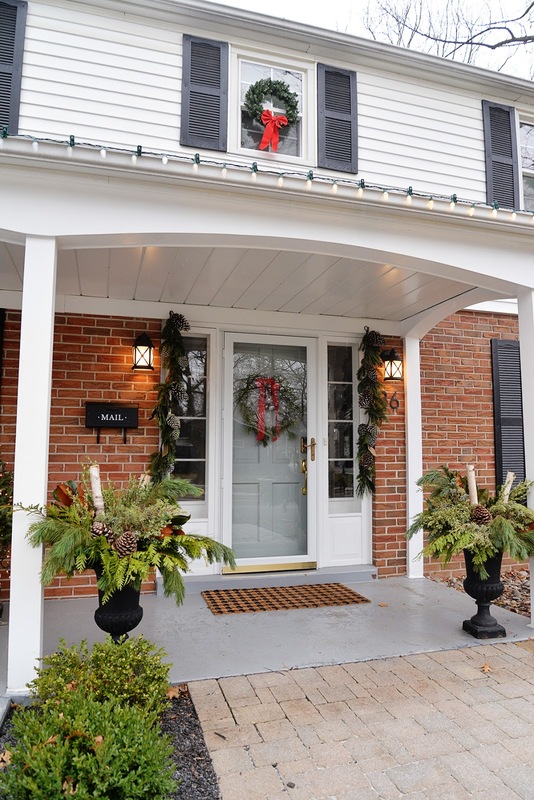 It's fun to take "real world" elements, like garland around the door, snow on the tree branches, and the wreath on the barn, and render them in icing form. If you've got more baking planned, I hope you'll try these cookies and let me know how they turned out! 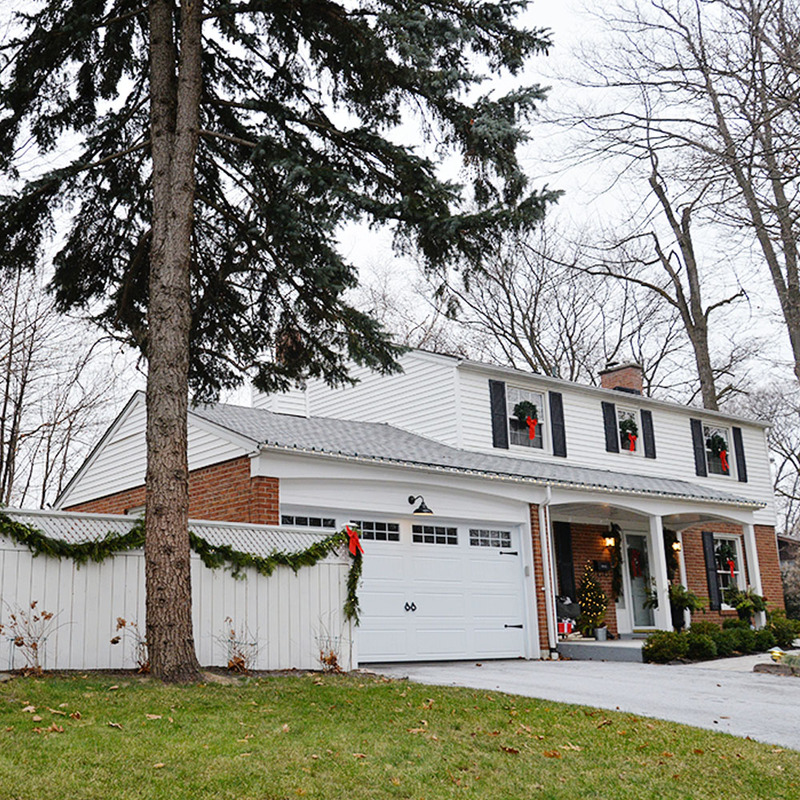 Our Christmas Home Tour continues today. 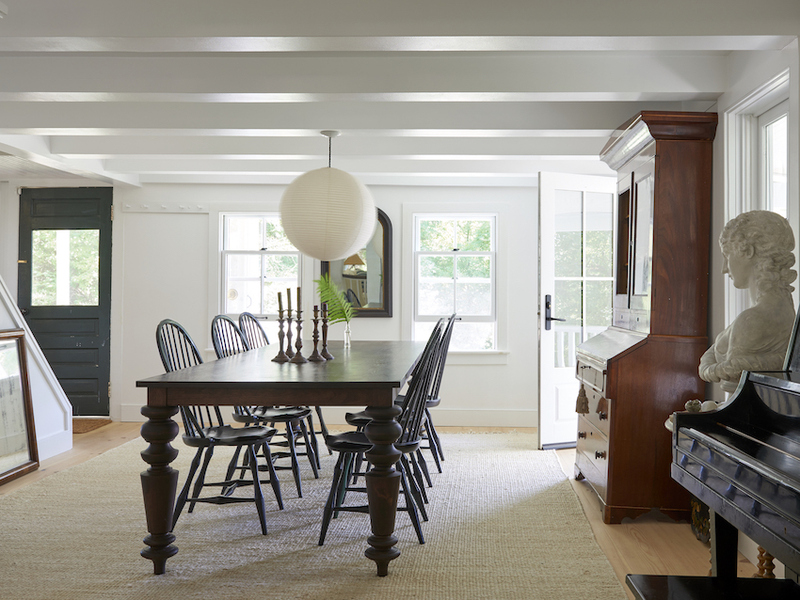 I've shown you the living room, the craft room, and the dining room. 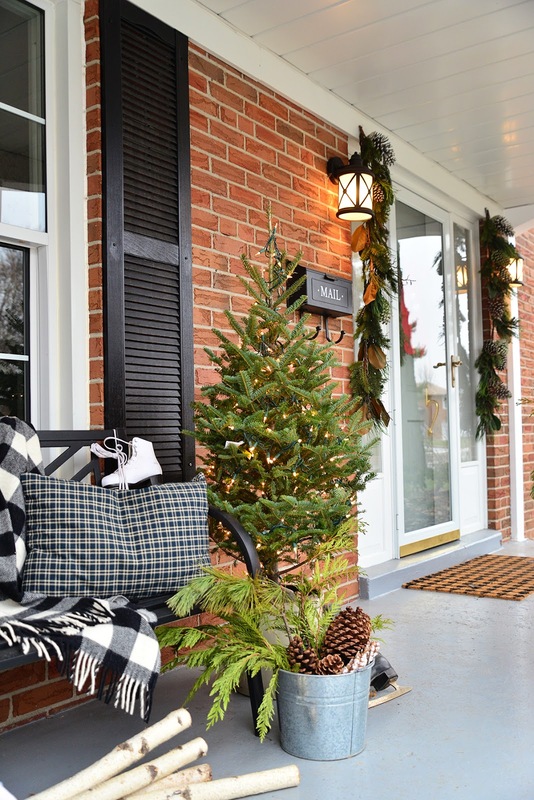 Now it's time to put your coat on, and join me outside for a tour of the exterior and our Christmas porch. I love having this covered porch. 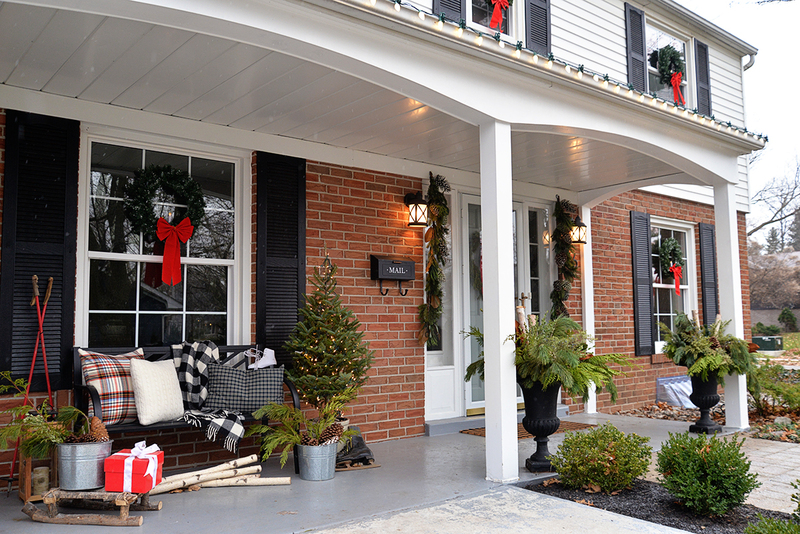 It's a fun area to decorate and it really brings some curb appeal to the front of our house. I've dressed this area with a cozy, nostalgic feel. 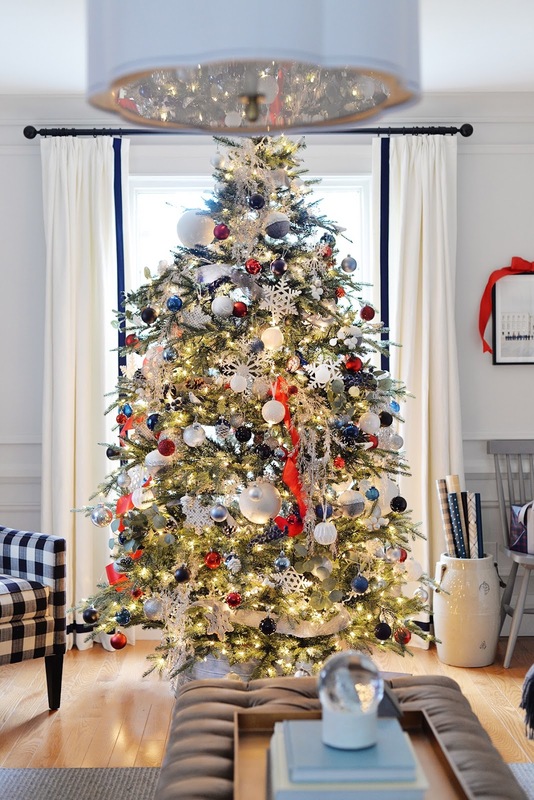 I've used many of the same things I used last year, like the wood sled and ski poles and added a few new touches, like the tree in the ceramic crock. 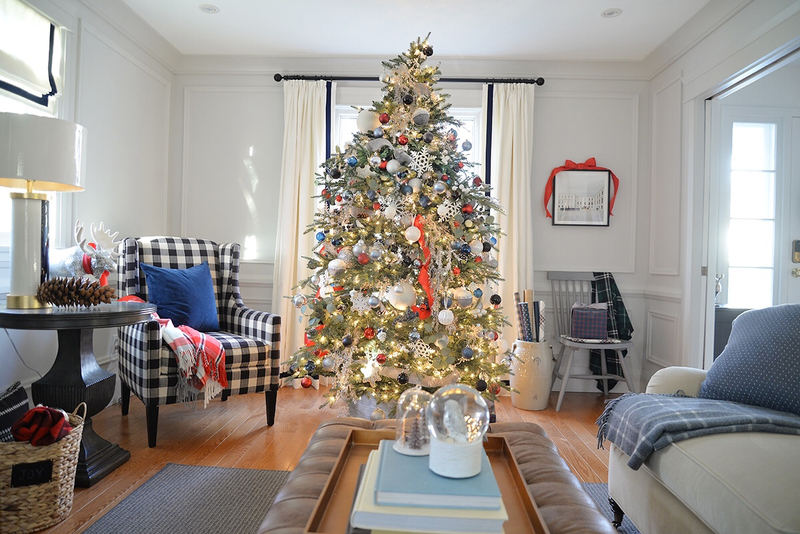 The twinkle of lights on the tree brings warmth to this area. We had planned on painting the porch floor this fall (you can see the worn paint in front of the pillars), but the weather turned cold on us too quickly. It'll be the first of our spring projects. 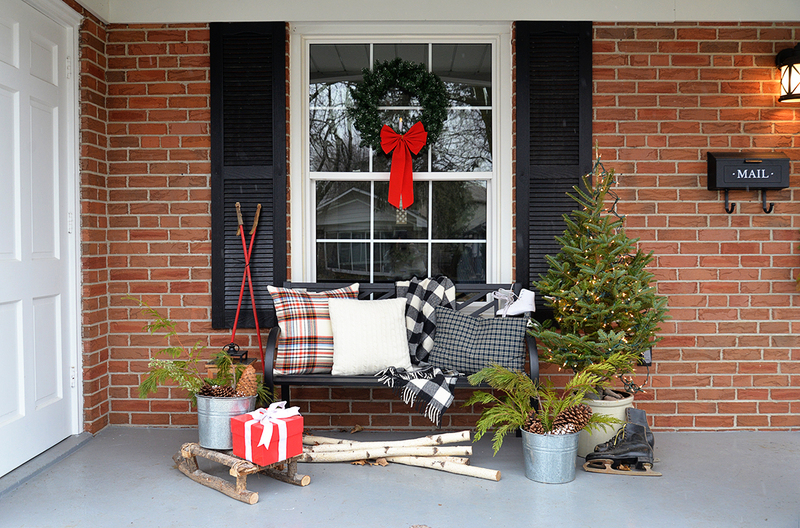 The rest of the porch is dressed simply. Two faux garlands line the sides of the doorway and I've used some leftover live garland to make a rustic wreath for the front door. 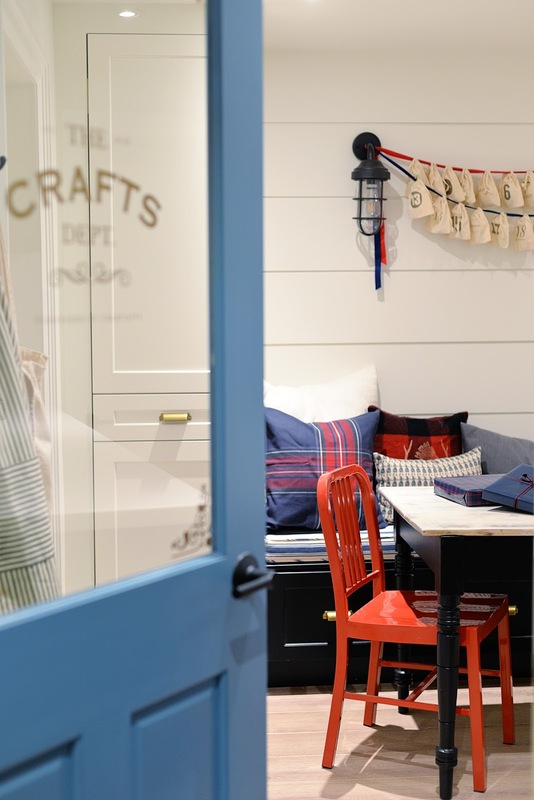 Our Ikea rug hack adds a bit of fun pattern. My DIY outdoor planters bring pretty texture too. 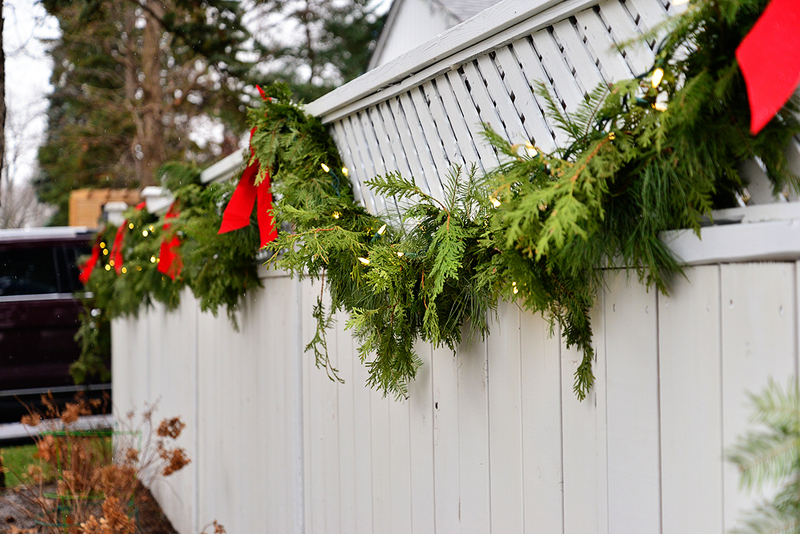 I was excited to get a garland up on the 'new' fence. 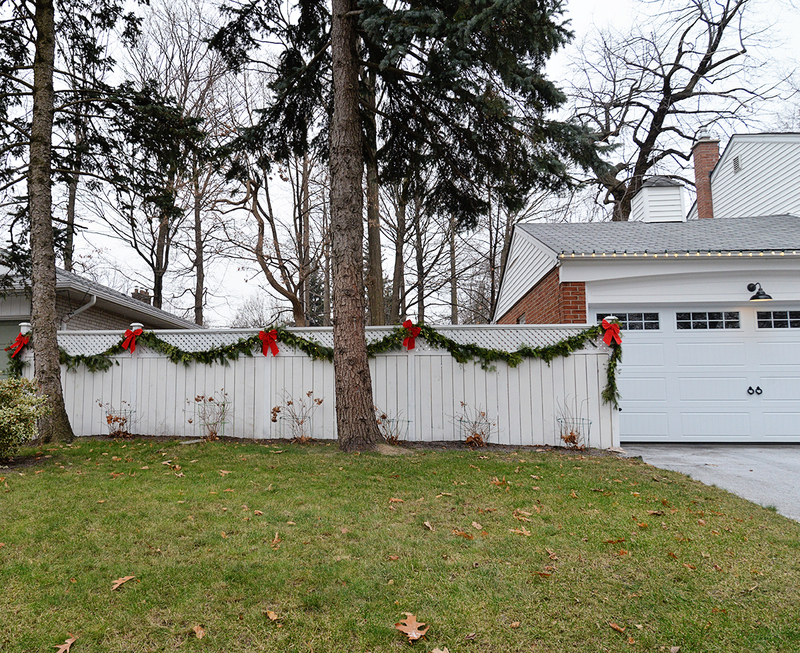 We only have a primer coat of paint on the fence, hence, it's not a bright white, but it looks great nonetheless. 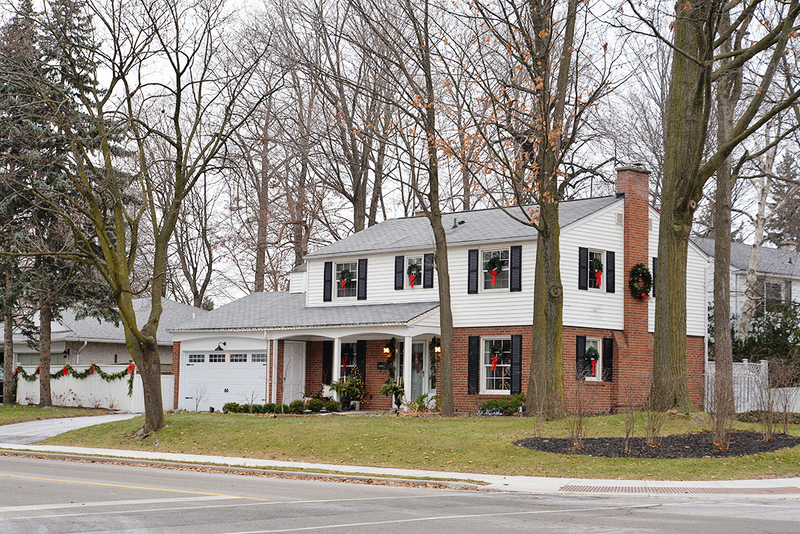 The white fence really ties the front of our house together and makes our property look twice as large. 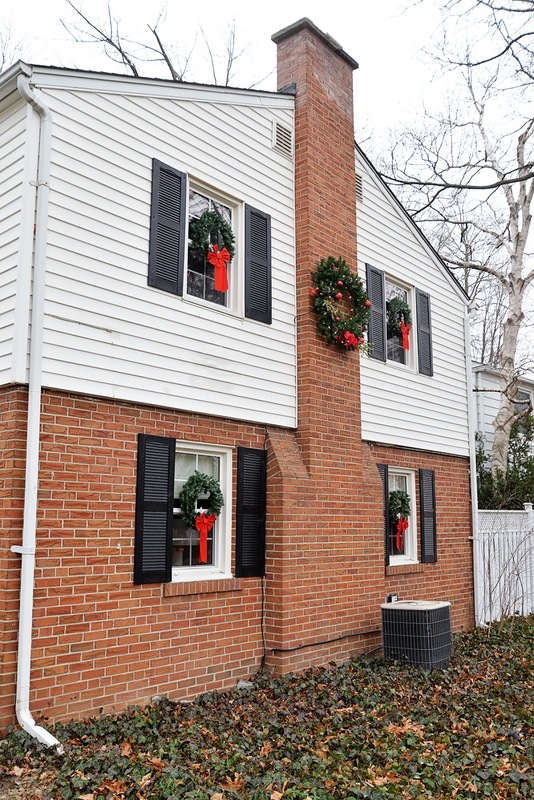 Just as we did last year, we've put wreaths with red bows in each of the windows and a giant wreath on the chimney. Its a traditional classic look and I just love it. We did add something new though... each of the wreaths has an electric candle in it. Can you see them? We can turn them on and off from inside using the remote control. It creates a very pretty Victorian-esque glow at night. I hope you enjoyed the tour. I know it doesn't look drastically different from last year's decor, but there is something comforting about keeping traditions at Christmas. I've just about finished my Christmas shopping (I've never been done so early!!) but I can't quite stop myself from shopping the online sales. 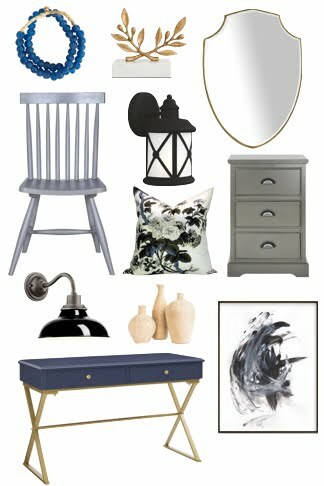 I've got plans to redo a few more rooms in our house in the new year like Chloe's bedroom and the powder room so I've got my eye out for a few specific items. It's a fantastic time to get deals, so why not shop? 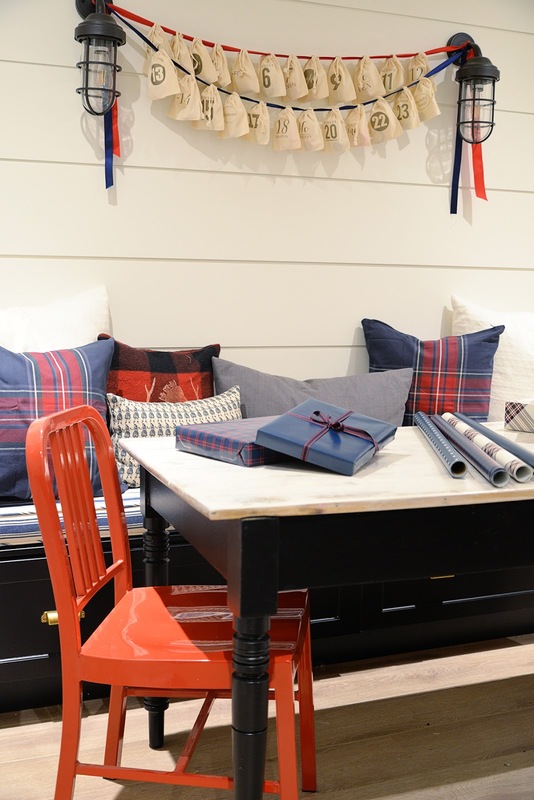 Speaking of deals, quite a few of the most popular home decor furniture and accessories in my home are on sale. 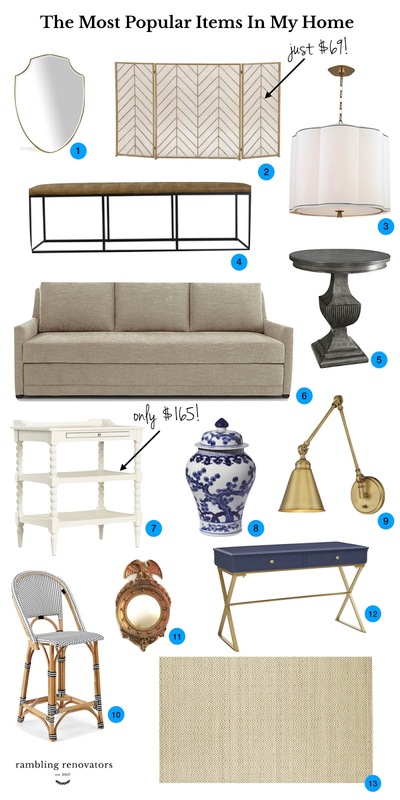 These are the products and home goods that readers and followers ask me about again and again. I wouldn't hesitate to recommend any of these items. They've proven to be stylish and reliable and have stood up to the demands of family life. Note: this post contains affiliate links. Prices quoted are in USD. 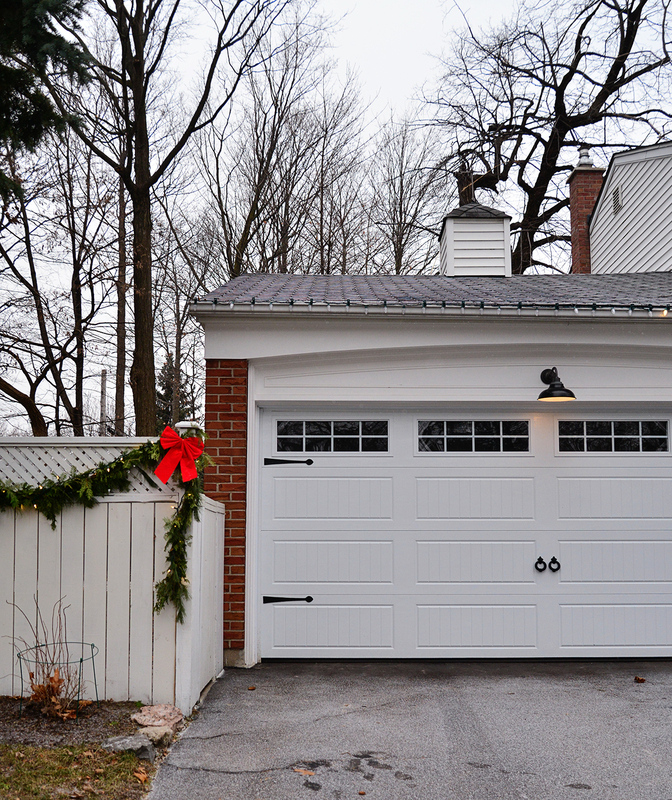 Do you have any renovating or decorating plans for next year? What are you shopping for? 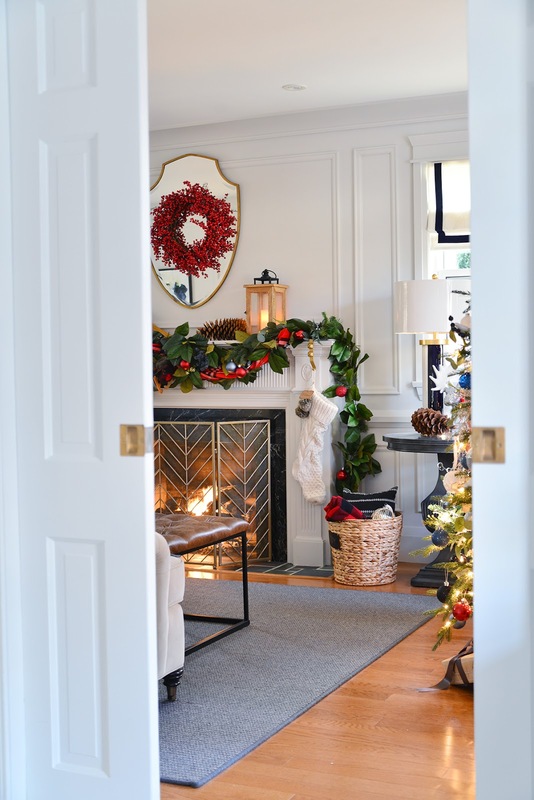 It's the most wonderful time of the year - and today is one of the most wonderful days on this blog! 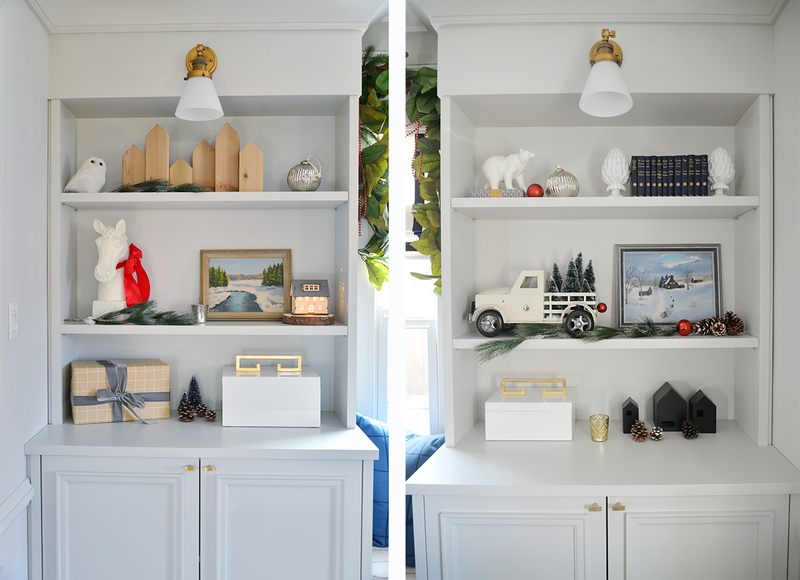 It's the Seasonal Simplicity Christmas Home Tour Week hosted by Krista at The Happy Housie and it's my turn to show you our home looking festive for the holidays. I've decorated a few different rooms in our home so for today I'll be showing you around the living room and dining room. Let's go! 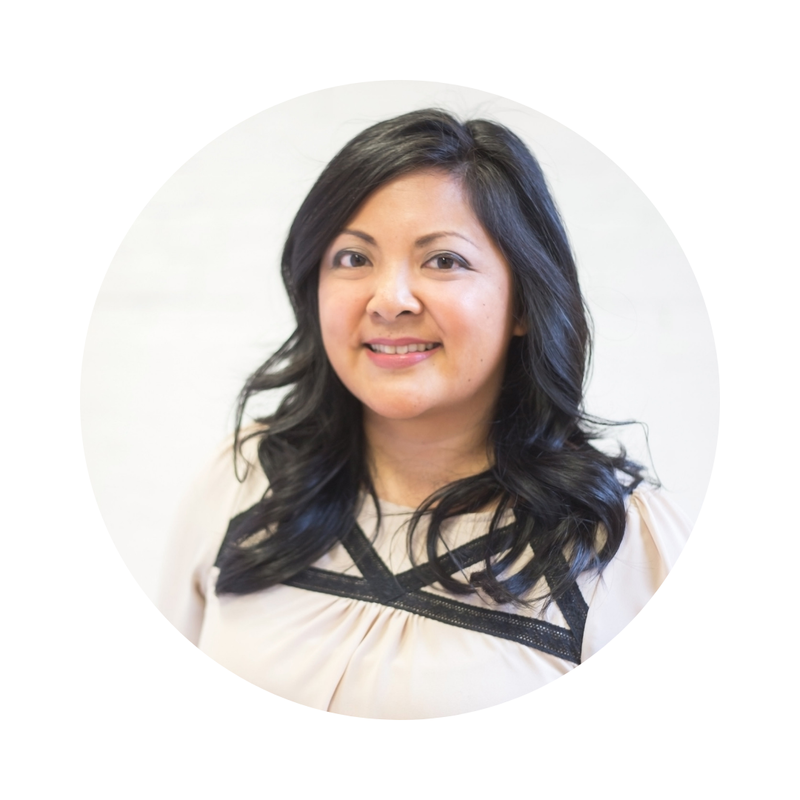 If you're visiting here from Lindi's home tour, welcome! Our living room is one of the most used rooms in our house but it truly becomes meeting place central at Christmastime. 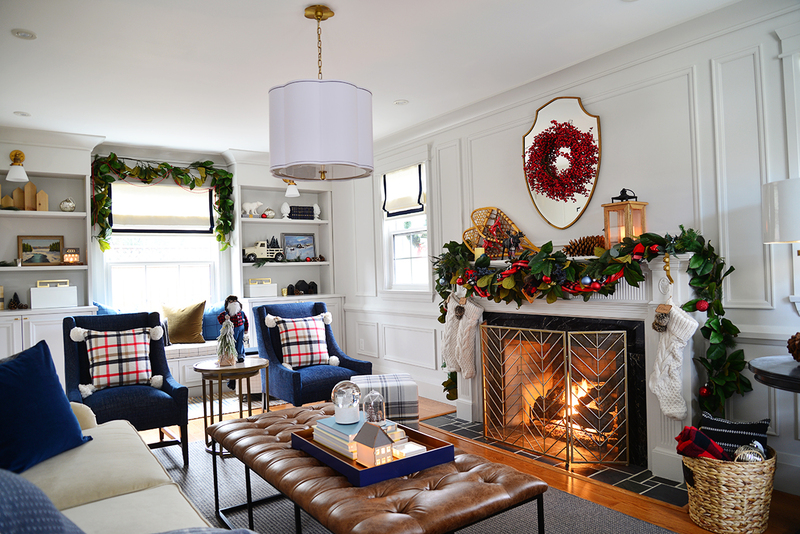 The lure of the fireplace and the Christmas tree become irresistible at this time of year. 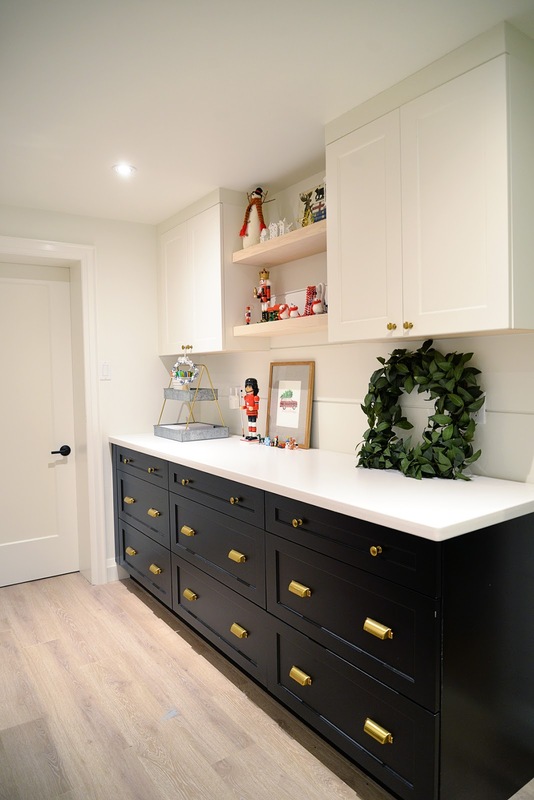 While last year's Christmas decor was a classic black and white palette, this year's look is lush, bountiful, and colourful. 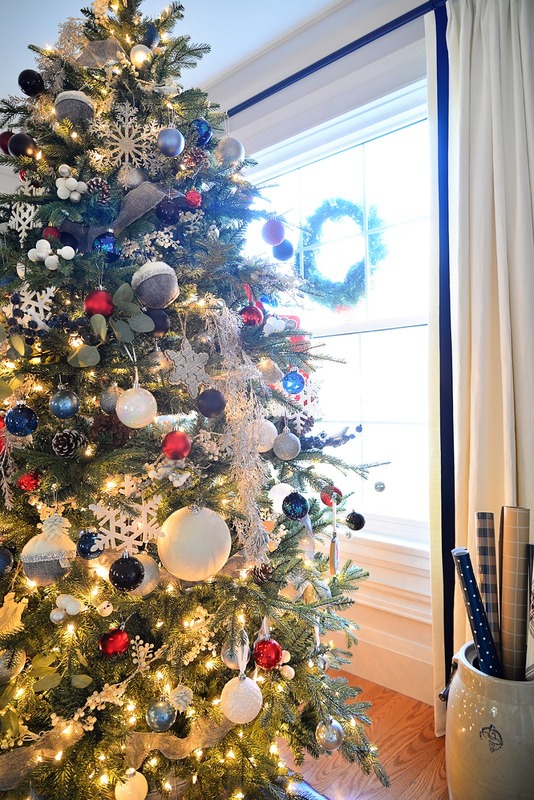 It started with the tree which was piled high with ornaments in red, blue, white, and black. I took a much more relaxed approach to decorating this year. I didn't think too much about symmetry and balance and went with the flow. 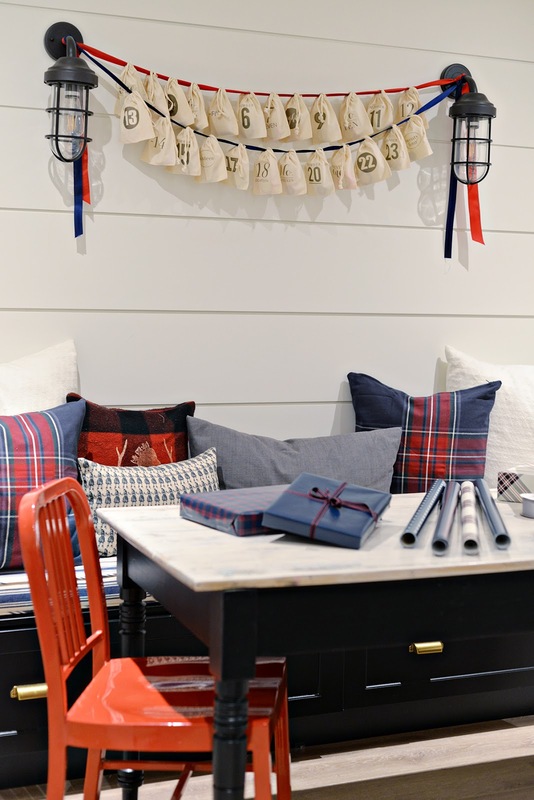 Little red accents around the room bring the neutral walls to life. I love a touch of vintage and the butter churn crock makes a unique holder for pretty plaid gift wrap. 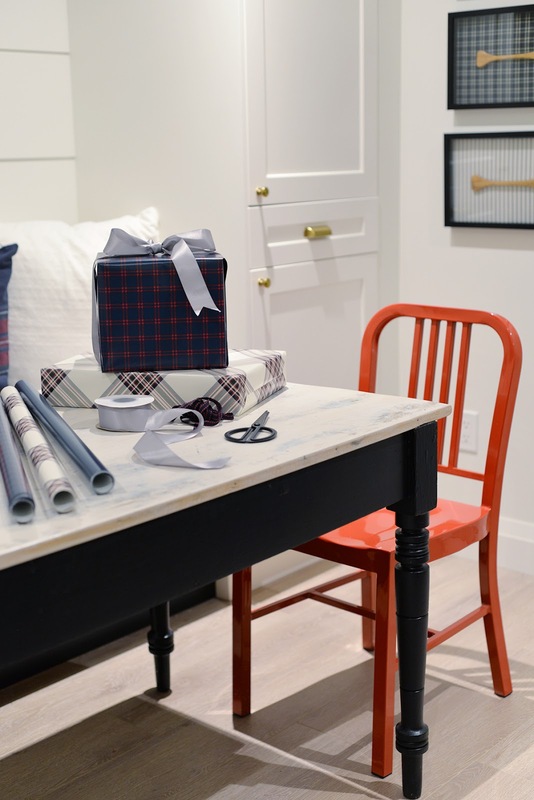 You can never have too much plaid for the holidays, am I right? ;) I always worry about having too many patterns but somehow they manage to work together. I took the same relaxed approach to decorating the mantel. 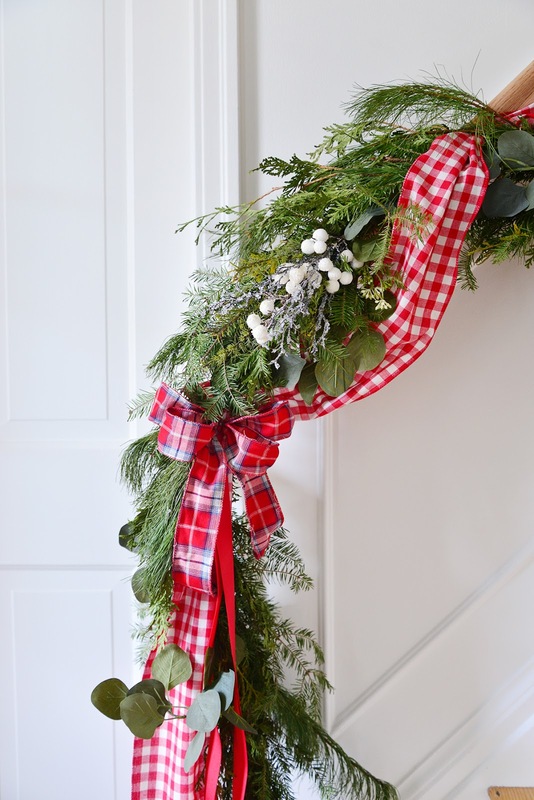 A loose, swagged garland captures the more playful, random feel of this year's decor. 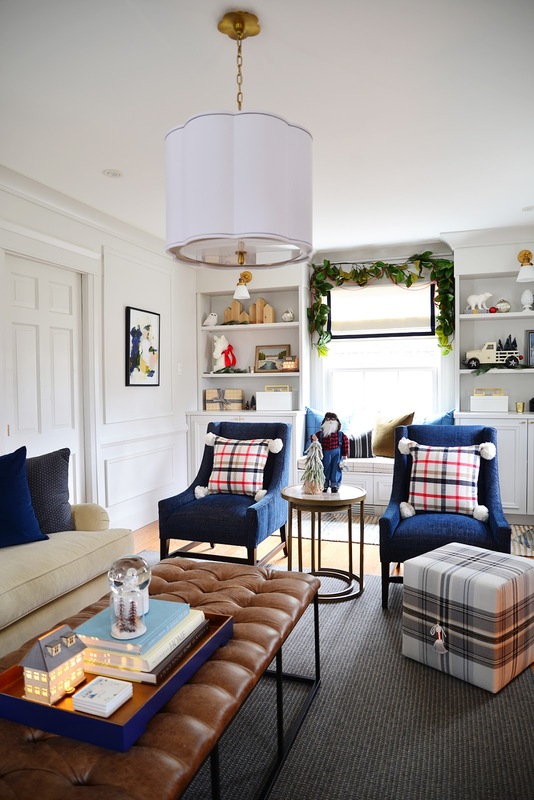 The plaid pillows with oversized pom poms add a cheery casualness as well. 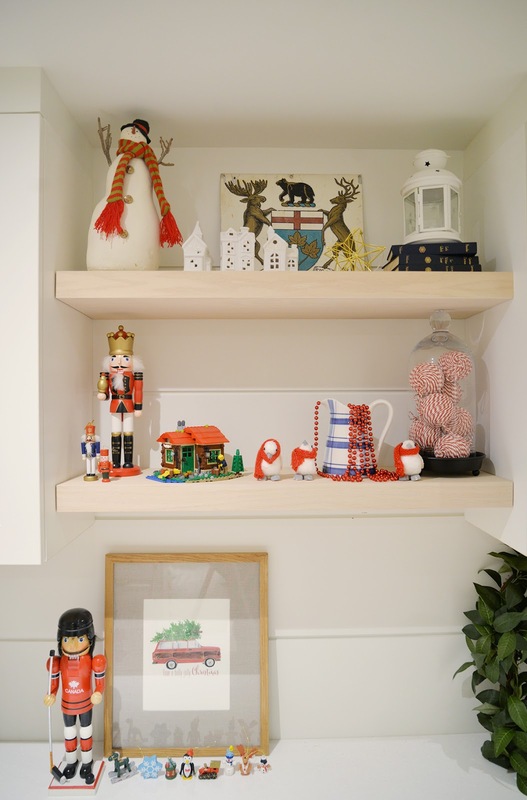 The built-in shelving and window seat are another favourite area to decorate. All of these pieces except for the truck and the tree sign are ones I've had for years. 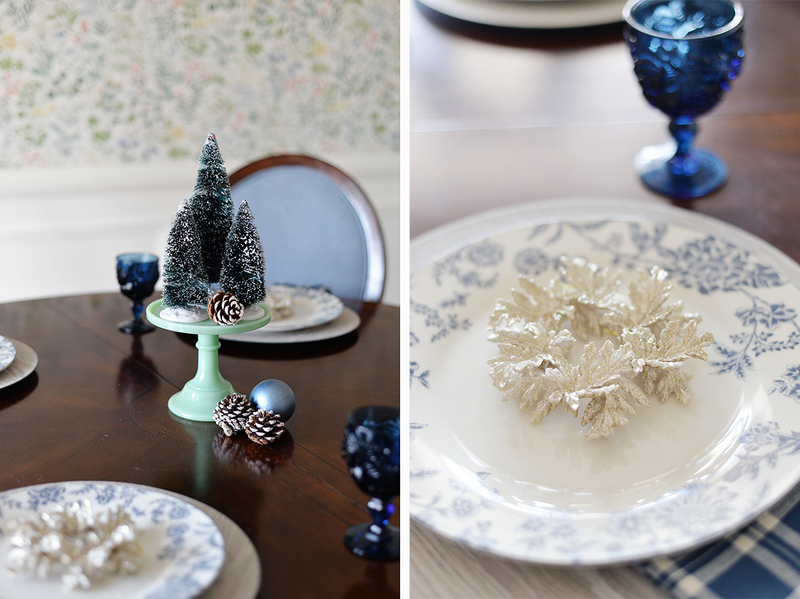 I love reusing the same pieces year after year; it feels part of the season's traditions. 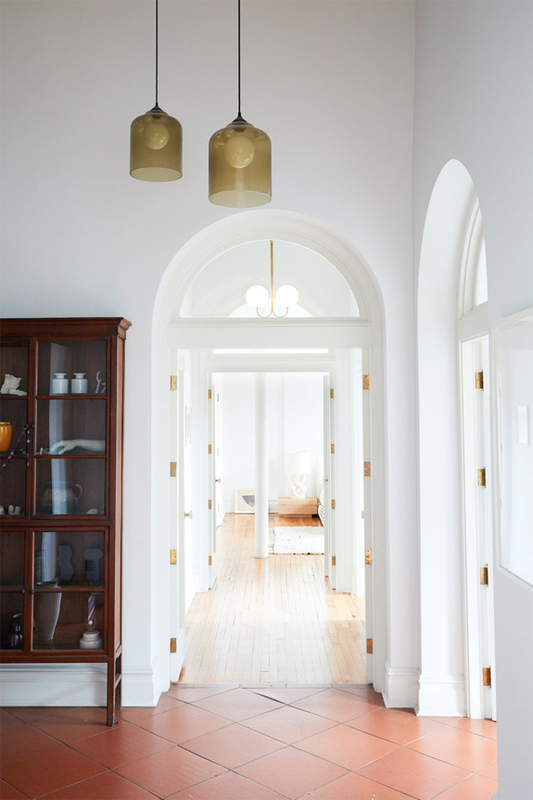 The recent WOW 1 DAY PAINTING hallway transformation was one of our best decisions. 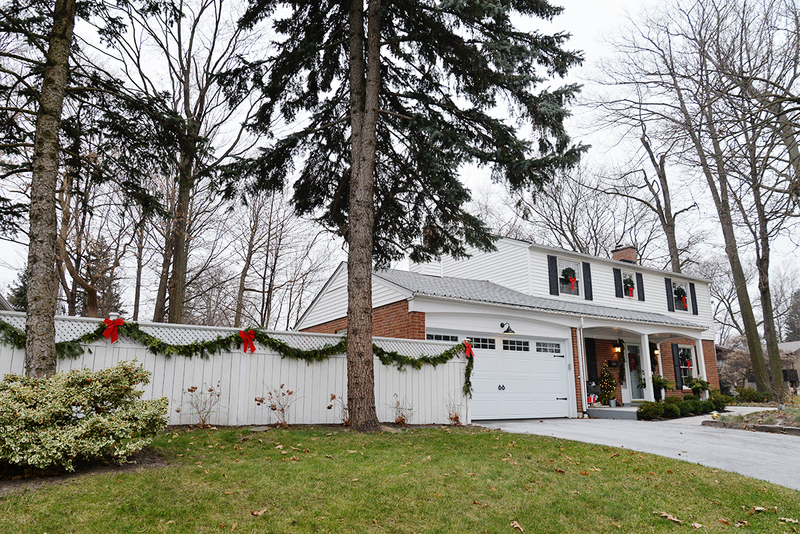 The white paint has made this area feel joyful and welcoming for the holidays. 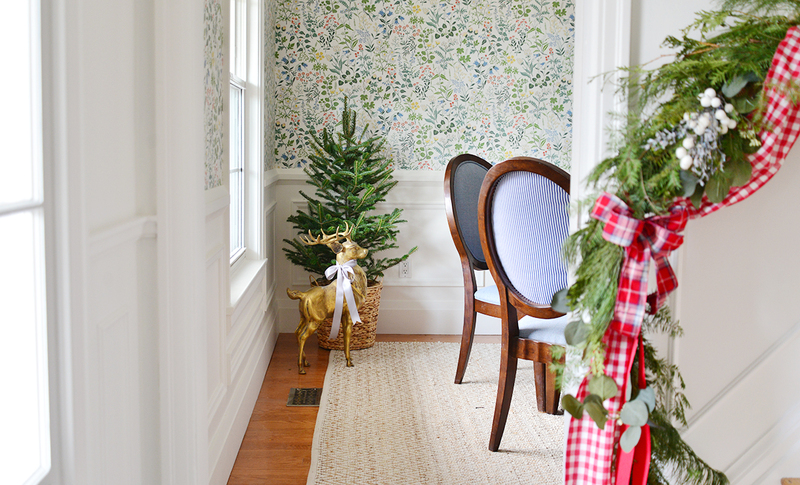 I've added a wreath to the back of the door this year and a new rug to bring in some colour. I especially love how the white stairs look. 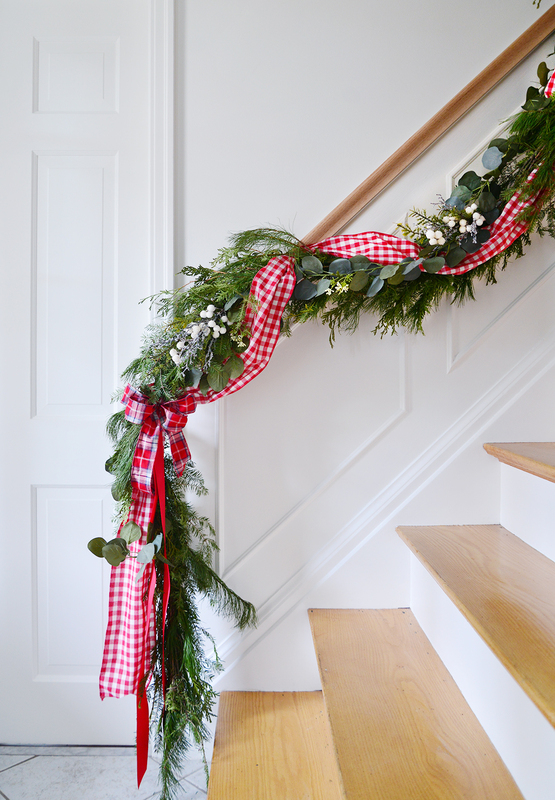 Creating the stair garland is one of my newest favourite traditions. 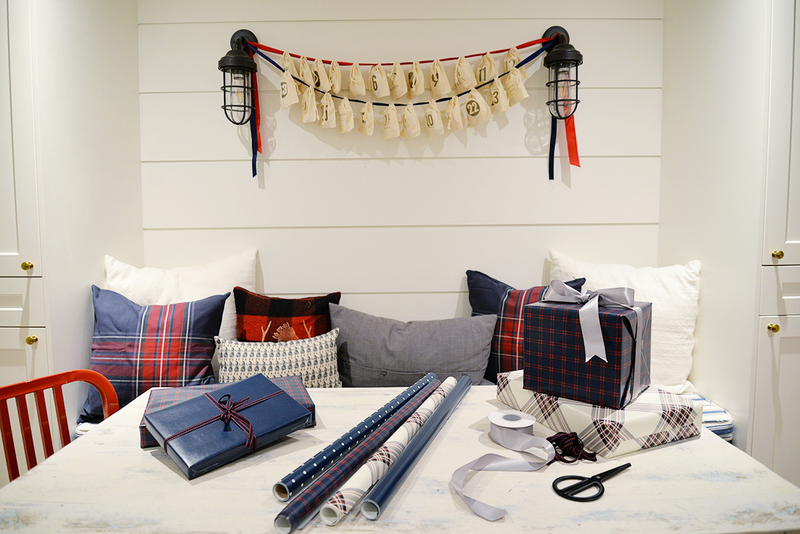 This year, I took a live pine and cedar garland and mixed it with faux eucalyptus and a variety of plaid and gingham ribbons. Tiny picks with little snowballs and glittered branches add a bit of interest and colour. Further into the dining room, you'll see I've kept things crisp and elegant. 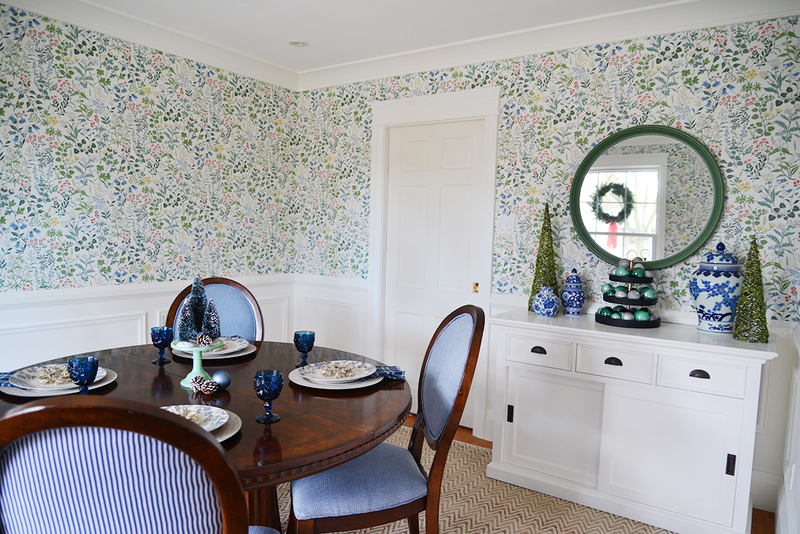 The colour scheme in this room is blue and green to coordinate with the wallpaper. 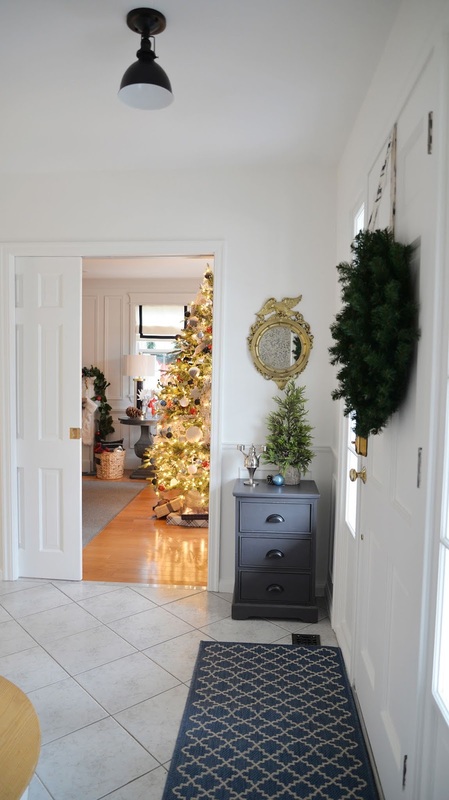 I can't wait to enjoy Christmas Day breakfast in this room! 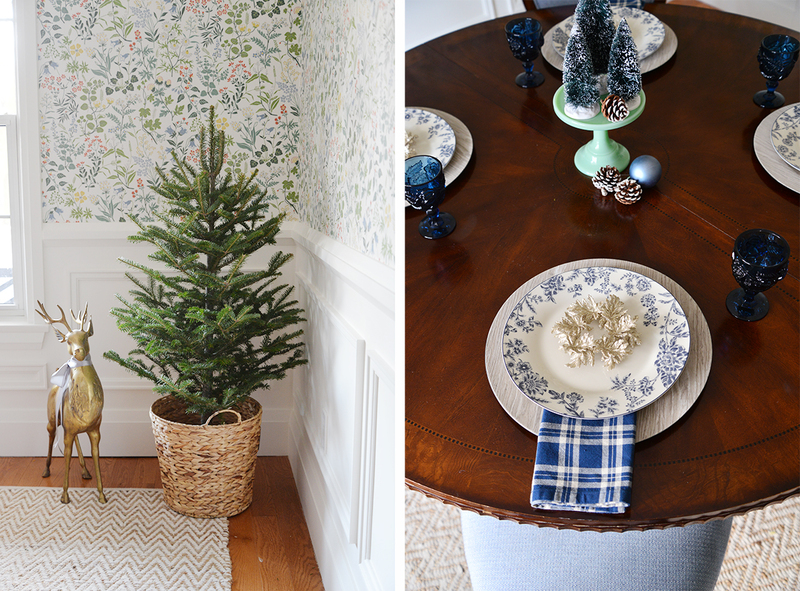 I've set a very simple table with plaid napkins and blue floral dishes set atop a faux bois charger and topped with a gold wreath ornament. 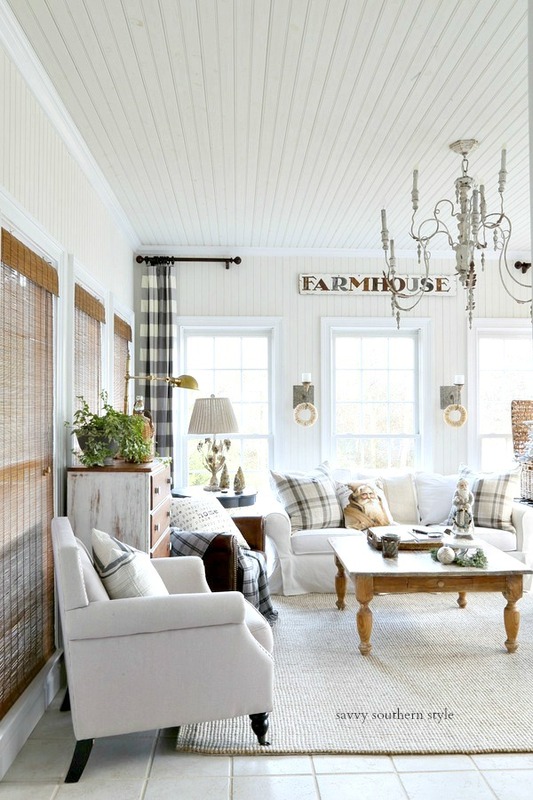 I just love the mix of florals and rustic textures. 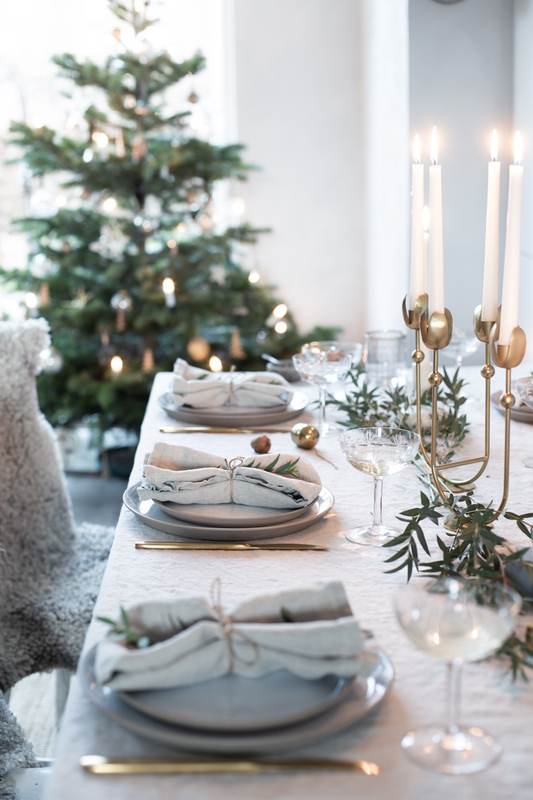 A brass elk and tree in a basket provide that same contrast of rough & polished. This might be my favourite view of all. I hope you've enjoyed seeing the living room and dining room. 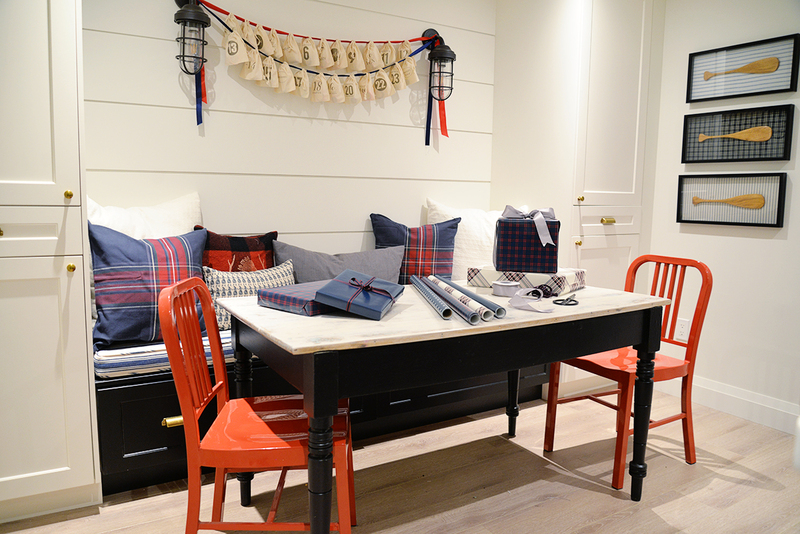 Come back tomorrow to see another festive space! 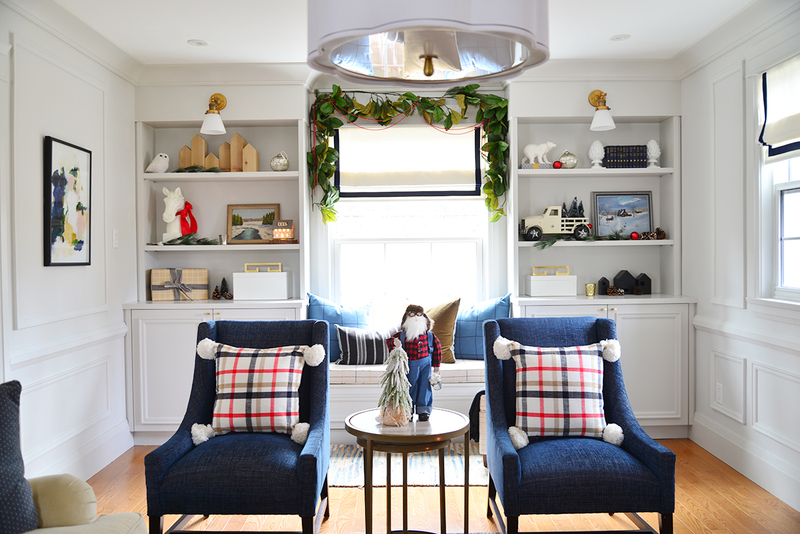 Now head over to Jennifer's home tour and check out her holiday decor and the other bloggers sharing today. 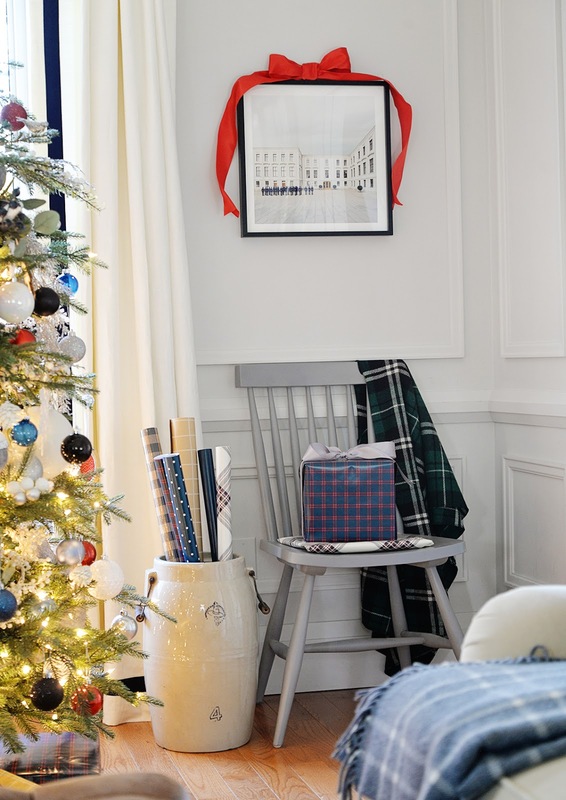 And don't forget, there's 45 Christmas home tours for you to visit this week!